WGI is both an FAA Repair Station and an ultra-precision machining facility that includes flat lapping tolerances of .0000116" (1 helium light-band) and diametrical clearances of .00005" for grind/round lapping applications. 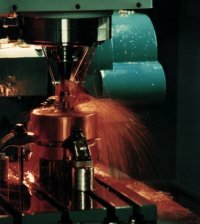 Special process approvals include grinding and lapping of coatings, grinding of titanium and hole finishing. Our max machining capability is 22 inches O.D. Starting stock is bar, forgings and castings. Materials include Stainless Steel, Alloy Steel, High Nickel Alloys, Titanium, Waspaloy, Aluminum, Bronze, Ceramic and Copper Alloys. Component expertise includes Bearing Seal-Seats, Seal Runners, Spacers, Supports, Support Assemblies (Squirrel Cages), Rings, Housings, Gas Spin Bearings, Knife-edge Seals, Gearshafts, Nuts, Sleeves and Bushings. We are ISO9001:ISO2008 and AS9100 revision "D" certified.